Just one of the main reasons to move to Sellersburg, IN, is the number of facilities and events for families. In fact, it appears as if our community is among the best places to raise a growing family! However, one area that still hasn’t quite caught on yet is better lawn care services. Whether a service provider charges a ton each month just for mowing, or you can’t find the care options you need, yard care is a tricky subject. However, one area company continues to lead the way to quality landscaping services. At Lawn Works, we’ve been assisting more area homeowners to achieve the perfect yard since 2015! We provide a variety of quality lawn care options, allowing you to own the perfect yard you’ve always wanted! 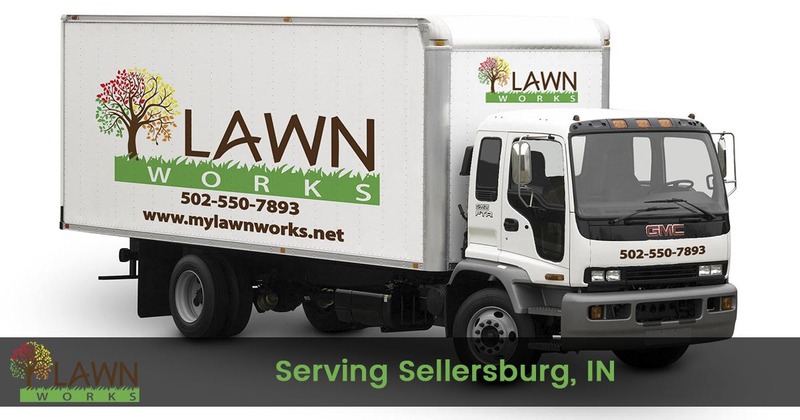 Call our team today and start enjoying better lawn care services! Whatever your yard needs to grow in green and thick, we can assist any plants you have. From getting your grass to grow in better, to total green space redesigns, we do it all! We have everything that you need for the perfect yard all throughout the year. Whether we’re preparing your plants for spring or keeping the snow away in winter, we do it all for less! Call us now for your convenient option in complete landscape service. We guarantee that no one else achieves the results that we do! We understand that, as a homeowner, you encounter numerous expenses each month. By the time you’ve paid for utilities, food and gas, and other daily costs, hiring a service provider is the last thing on your mind. However, our team provides nothing but the best landscaping service options at affordable pricing. In fact, chances are we’re less expensive than who may be handling your lawn and landscape now! Instead, we’ve provided a broader range of assistance options at a lower cost to you every month. Whether your yard remains coated in fallen leaves in autumn or you need to know your grass will survive the summer heat, we’re always here for you. Call us for the best in affordable lawn care services. You’ll be impressed with the quality of our results and the lower pricing each time! When your yard deserves the best in local landscaping, you need our experts assisting you each month. Call today for a free quote and discover how we can save you more on the perfect yard! We want you to be totally thrilled with our services... so absolutely delighted you will recommend us to your friends and neighbors. You are the judge, if our work is not excellent, we will re-do the item in question for FREE. Nothing is more important to us than your complete satisfaction.